Hey all, again I've been trying to come up with some new ideas for a DIY and possibly a new tabletop force. 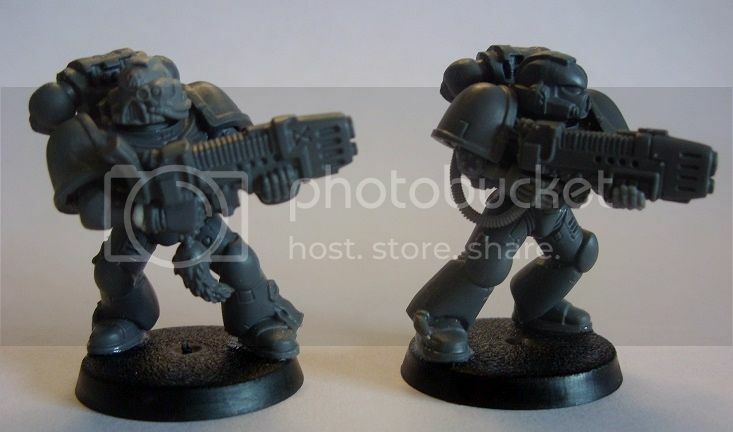 Having looked throught the Iron Hands discussion thread in the Index Astartes, I decided I'd like to try my hand at some of the scions of Ferrus, as there are some nice opportunities for modelling bionics and also for cool list building with C:SW/SM allies. However, as it's me I wanted to bring some other ideas to make it my Chapter. What I came up with was to focus on and add to the clannish aspects of the IH, aiming to build a Chapter of superstitious, mistrustful, stubborn techno-barbarians. That's fairly naturally brought in some celtic influence to the ideas too. When it came to the name, I wasn't sure to start with, but after a bit of thought I remembered I'd already decided what I'd call an IH Successor if I ever did one. Hence they are the Marines Adamant. Not the most barbaric/celtic name, but hey, they started off with an IH for a commander (or possibly a Brazen Claw, simply because their Homeworld is - relatiely - quite close to where the MA will be assigned). Anyway, done quite a bit so far but I'd really like to get some opinions from the other Liberites, see if I'm heading in an ok direction. Brutal, insular, superstitious and paranoid. Most would describe the Marines Adamant with words such as these. Those few who enjoy better relations with the Chapter could not argue with such an assessment, but might also speak of other, nobler qualities such as bravery and unbreakable determination. During the thirty-second millenium, the Orks rampaged across the galaxy, at great cost to the warriors of the Adeptus Astartes. Countless human worlds were swallowed up by the green-skins’ barbaric empires, and by the time of the 4th Founding few had been reclaimed, primarily due to the colossal drain of holding back the horrors of Abaddon the Despoiler’s second Black Crusade. The Marines Adamant were therefore assigned to the eastern border of the Segmentum Obscurus with a dual purpose: reclaiming the nearby worlds lost to Orks while supporting the defences of the Eye of Terror when needed. The fledgling Chapter’s gene-seed was that of the Primarch Ferrus Manus, and at the head of their training cadre was Clan Commander Elvrit of the Iron Hands, a hero of the many battles of the second Black Crusade. He led his brethren to war and they quickly formed a close bond with the Gharant III Forgeworld in the Havilar Sector, whose vast manufactoriums, Skitarii regiments and Titan Legion were already forming the lynchpin of the Imperium’s beleaguered defence against the Orks. Since then, the Chapter has mainly fought against the vile Ork: defending against encroaching Waaghs, raiding into Ork territory to destabilize growing threats, or spearheading massive Imperial Crusades to reclaim worlds lost to Mankind hundreds or even thousands of years earlier. On occasion they have sent forces west to support their brother Marines against the renegades of the Eye of Terror. Throughout the millenia, across countless battlefields, the Marines Adamant have remained resolute, loyal servants of the Imperium. 'My world? It's cold, it's damp. What business is it of yours?' – Brother Hani, 4th Household. Halsstarrig IV is a Feudal world, located in the same subsector as the Gharant system. It was discovered more than four centuries prior to the arrival of Elvrit and his men by Adeptus Mechanicus Explorators and immediately marked as an ideal Astartes recruiting ground. Halsstarrig has a single primary continent, with several smaller landmasses and surrounding island chains; all are cold and bleak due to the planet’s far orbit from the local sun. Its atmosphere is damp and thick mists often cover its mountains, forests and seas. The people of Halsstarrig are strong and fierce, yet primitive in their technology and outlook. Clans vie for land and key resources such as the iron ore that provides all their tools and weaponry. The people are by nature aggressive and suspicious, and therefore trading or alliances between the clans are very rare. Raiding is a regular occurrence and outright warfare only slightly less so. Strength and survival are the primary factors that determine right and wrong, but the resulting potential for brutality is balanced by a firmly held code of honour, the core elements of which are shared by all the clans. This code demands a clansman’s loyalty to his chief, and the chief’s protection to his followers. While any proven warrior may challenge his chief for the leadership of a clan, such contests are strictly proscribed by custom and ritual. Anyone who would attempt to gain power by any other means would be quickly shunned by all the people. The clans are also very superstitious; fearful of the influence of the myriad sprites, imps and wights of Halsstarrig folklore. Many offerings are made by the clans to appease these spirits and natives often wear protective tokens and charms. Almost all learning beyond the basics of farming, fishing or fighting is the province of the Wyrds, or wise men. Common to all the clans are the Wyrds of the Flesh, local physicians and herbalists; and Wyrds of Iron, smiths and artisans. Highly respected, these often act as counsellors to their clan chiefs. Outside the clans, shunned but still respected, are the Wyrds of the Spirit, shamans who live in seclusion deep in the mountains or tiny ocean islets of Halsstarrig. They are feared for their uncanny abilities and closeness to the spirit realm, but sometimes a clan Chief or young warrior will travel to seek the Wyrds’ blessing or learn their future. The Fortress Monastery of the Marines Adamant stands on Halsstarrig’s first moon, a vast and imposing structure protected by countless weapon batteries, powerful void shields and the cold blackness of space itself. The Astartes are almost never seen on the planet’s surface, making no deliberate contact with its people. Legends exist of monstrous giants, and such legends are tied to those of young warriors ‘taken by the mists’ and never seen again. These ones are mourned by their families; the people have no idea of what lives await beyond their moors and skies. New initiates into the Chapter invariably rail against their captors, seeking escape, until they learn of the true nature of humanity and the debt of honour their whole world owes the Marines Adamant for their protection from the horrors of a cruel galaxy. ‘Aye, I don’t much like those dumskalle of the 5th… but I trust them far better than I do svekling like you.’ – Warleader Jormgrun Stonebrow of the 7th Household to Colonel Bardel of the 143rd Ardravine Rangers. Much like their Iron Hands forebears, the Marines Adamant are divided into ten Clan Households, united by a Clan Council. Officially, this assembly maintains control over the actions of the Chapter as a whole. In truth it is little more than a forum for the commanders of the various Households to air their grievances, brag to one another of their victories, or attempt to ensure their own pre-eminence within the Council. Each Household fights as an autonomous battle group led by its Warleader, a mighty warrior who has risen to command through a mixture of politicking and battle skill. His forces include his own advisors, veterans, line squads and new recruits. This means that each Household is somewhat larger than a Codex-compliant Company, and that it is harder to accurately calculate the numbers of the Chapter as a whole. The Households each maintain their own well-equipped armoury of weapons and vehicles, many including a sizable Dreadnought contingent. The veterans of each Household are named after Halsstarrig tradition. When a native Clan leader sleeps, as all men must, he is protected by a ring formed of his most loyal warriors. Given the people’s naturally suspicious nature, it is a great honour to be considered faithful enough to guard the fire of one’s Lord. Within a Marines Adamant Household, the Hearthguard are the iron core of its fighting strength, an immovable and implacable force around which the Warleader can build his strategy. Many fight as squad leaders, inspiring and exhorting their brethren, but the few who are most trusted form the personal retinue of the Warleader. When the Hearthguard go to war as one, there are few who can stand against them. The Chapter’s Techmarines and Apothecaries are also a permanent part of their respective Households. These masters of arcane technology, known by the Marines Adamant as Wyrds of Iron and Flesh, work together to care for the Astartes and vehicles of their Household and are just as esteemed as their home world counterparts. The Iron Wyrds are especially numerous and influential within the Chapter given its ties to the Adeptus Mechanicus and each will travel to Gharant III as part of their instruction. The brethren known as Spirit Wyrds are powerful psykers, feared and yet respected by the rest of the Chapter. Cast out and denied any hope of personal advancement or glory, these mystics are oddly viewed as more reliable since they can have no agenda of their own. As such, the Spirit Wyrds often act as arbitrators when the Clan Council meets and as observers for it when a Household goes to war. They live in voluntary separation from the Households in a small stronghold on Halsstarrig’s second moon, called the Spirit Hearth. While much of a Household’s past is remembered in oral form, the Spirit Hearth is also a repository of the written records of the Chapter’s most important history, including their greatest victories and most ignominious defeats. The Chapter maintains close links to the Gharant III Forge world and has a permanent Keep on its closest neighbour, Gharant V. The vast seas of this oceanic Hive world provide much of the local Adeptus Mechanicus’ nutritional requirements and its people receive many technological benefits in return. The Marines Adamant do not recruit initiates from Gharant V, but they do select the majority of their Chapter serfs and Fleet crews from its Planetary Defence Force and Navy. These are vetted with almost as much care and suspicion as potential Astartes. Generally, one Household is assigned by the Clan Council every century to watch over the system in return for keeping the Chapter well supplied. This is often seen as a lesser assignment by the Astartes as the system is already well-defended by the capable PDF, as well as Skitarii regiments and the mighty Titan Legion of the Gharant forges, the Silver Hammers. 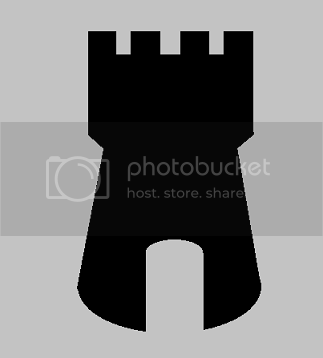 However, the Warleaders accept the necessity of maintaining this millennia-old bond and often the Council assigns the duty to whichever Household has been most weakened by battle in recent years, giving them an opportunity to rebuild and rearm. Also, there are still some opportunities for glory to be won as elements of the Household will often provide elite support for Explorator teams or Titan battle groups, or act as bodyguard squads for important members of the Gharant forges. 236.M35 – In an event unprecedented in the sagas of the Chapter, Warlord Fingil Bloodfist of the 4th unites all ten Households of the Marines Adamant under his banner when the Ka-sil Craftworld of the Eldar enters the Havilar Sector. Less than three years later, Ka-sil is a ruined, empty husk inhabited only by the ghosts of the fallen. Fingil is also dead, assassinated by five of his fellow Warleaders after declaring himself Chapter Master at the conclusion of the campaign against the Eldar. When larger campaigns require that several Households fight together, they can be led by a Warlord, elected from among the Warleaders present. In such situations there is inevitably a certain amount of wrangling for power and the potential for personal glory it brings. Any candidate for the position must be nominated and backed by at least two other Warleaders, meaning that there must be at least three Households fighting together to appoint a Warlord and there can be at most three candidates even if the whole Chapter fights together. The Warleaders will vote at first, each attempting to gather support and undermine their rivals, but if no democratic decision can be reached the candidates fight in imitation of Halsstarrig custom. Generally this is to first blood but on rare occasion, when two candidates are so opposed that service to the other is an impossible request, it is to the death. Understandably, the appointment of a Warlord is a very rare thing, and he may only lead for as long as the specific campaign lasts. ‘All flesh is weak. It must ever be constrained, guided. Thus the Code.' – Brother Nisses, Spirit Wyrd. Like any of the scions of the Iron Hands, the Marines Adamant are ferocious warriors, fuelled by their hatred of all weakness. However, unlike many other Successors, their contempt for the foibles and faults of the flesh tends to find its focus externally rather than internally. This means that for many among the Chapter, the self –loathing and obsession for mutilation so common among the gene sons of Ferrus Manus seems to be lessened, although never entirely removed. Instead, the brethren’s fixation is on the inevitable failings of those around them and all are quietly watchful for any sign that they are about to be betrayed. This paranoia makes it extremely hard for them to truly trust anyone, even their closest squad mates. It also means that competition for advancement through the ranks is fierce, as most Marines instinctively believe that any other candidate for promotion will undoubtedly be proved a poor choice. Disagreements between brethren occur all too frequently and are commonly settled at the point of a knife, though thanks to the Astartes’ superior physiology, fatalities are mercifully rare. Backbiting and brawling are part of everyday life, as are ‘accidental’ injuries caused during training exercises. It might seem that a Chapter cursed with such an outlook would quickly tear itself apart. However, the Marines Adamant are constrained by a simple Code of honour and duty much like that of the Halsstarrig clans that insists upon the absolute loyalty of the brethren to one another and to their Commanders. Remarkably, it is the Chapter’s own obsessive tendencies that allow this arrangement to function and makes it possible for its members to work together, binding them to one another within the Code’s strict confines. This holds the brethren together and has thus far prevented the power struggles among the Households from becoming a battle of more than words and wills. This does not mean that all causes for conflict are removed, but in around eight millennia since the inclusion of the Code in the Chapter’s hypno-indoctrination procedures, there have been only three occasions where violence has erupted between the Households. A fierce spirit of competition still exists between the Warleaders, who view one another with a great deal of suspicion, but they are united by their honour, their duty to the Chapter and their greater hatred of the enemies of the Imperium. 873.M37 – The 4th Household, battered but unbowed, returns home after sharing in the defence against Abaddon the Despoiler’s 7th Black Crusade. On route, they receive a distress call from the Adeptus Arbites Precinct House on the Hive World Cal Ferena, where a rebellion among the working classes of the primary Hive is attempting to take advantage of the tumult caused by the followers of Chaos. The Marines Adamant immediately deploy via Drop Pod, targeting the Hive Spire with its multitude of spaceports. Understrength, the Household cannot hope to defeat the millions of insurrectionists in open combat, but thankfully this is not their goal. The thirty-eight Marines Adamant take and fortify the entrances into the Spire and resolutely defend them against dozens of attacks. No supplies enter the Hive and within four weeks the starving rebels capitulate, surrendering unconditionally and presenting the heads of the revolt’s ringleaders as a peace offering at the Astartes’ barricades. It is perhaps not surprising that the Chapter's view of the Emperor himself is similarly cold. The master of Humanity is not seen as a beloved father, provider or saviour. Rather, the Marines Adamant know him as a demanding and brutal overlord whose expectations must constantly be met. A Marine of the Chapter can expect no aid or special favour from his Lord in this, but must put his faith in his own strengths and abilities in order to fulfil the heavy load of responsibility placed upon the Astartes' broad shoulders. As such, it is somewhat understandable that the Marines Adamant do not maintain in their Households any position or rank relating to that of Chaplain in a more Codex-compliant Chapter. For most Marines, their focus is totally on war, be it actual combat techniques, weapons training or strategy and tactics. With no interest in knowledge or learning of anything more, they share nothing with the artists and artificers of Chapters such as the Blood Angels or Salamanders. These things are the province of the Wyrds, and are irrelevant to a warrior. While the Households are equally as capable as the brethren of any Chapter to care for their weapons and armour to a basic standard, this understanding, indoctrinated during process of becoming Astartes, is viewed as entirely mystical. Relatively few care or wish to learn more, to understand why things are what they are or how they work; these few are quickly apprenticed to the Wyrds of their Household. The Chapter is strongly affected by the superstitious nature of Halsstarrig’s people, and many among their ranks adorn their armour with tokens and lucky charms. Much as clansmen wear trophies from their world’s predators, Marines often wear the teeth or pelts from particularly vicious alien species they have fought and killed. Depending on which of the clans of Halsstarrig they are recruited from, some brethren choose to daub crude patterns on their faces before going into battle. Such primitive behaviour, along with the majority of the Chapter’s attitude towards technology, has been known to make other Imperials, especially other Iron Hands Successors and Tech Adepts from further afield than the Gharant forges, look upon the Chapter with a certain amount of derision. ‘As always, it has been a pleasure to serve alongside the Marines Adamant. My crews’ only complaint has been that too few of the enemy survived to face our fury.’ – Lord Maxwell, Princeps Senioris of the Legio Mallei Argentum. 417.M39 – Waagh Gutrippa surges forth from the depths of the Abyss to attack the Gharant system. Through clever words and cunning manipulation, Warleader Dypnir the Sly is elected Warlord and leads no less than five Households to turn back the greenskin threat. Dypnir’s forces gradually retreat before the horde, their myriad counterattacks slowly bleeding it of strength, and when the depleted Waagh finally reaches the Hives of Gharant V, it is easily destroyed by the mighty battle Titans of the Legio Mallei Argentum. When the Chapter goes to war they are cold, brutal and uncompromising. Their focus is on implacable advance in attack and they are even more unbending in defence. Overall, the Marines Adamant have a preference for firepower and resilience over speed. So often do they choose to take up defensive positions, most Households are able to equip three or four squads with multiple heavy weapons. The Chapter rarely uses ground transports; the plentiful supply of war material from Gharant III means that most Rhino chassis are quickly refitted as Predators or other support tanks. Much like the Iron Hands, they have deep respect for power of Tactical Dreadnought Armour, which will often be spread across a Household to its squad leaders rather than used by a single unit. When attacking, the Households favour drop pod insertion supported by Dreadnoughts. The Chapter has very few assault focussed units, though line squads expected to be ready – and are very capable – to fight at close quarters when necessary. Bikes and jump packs are rarely used, though each of the Households still maintain some fast vehicles and transports such as Land Speeders, Stormtalons, Stormravens and Thunderhawks. Due to the Chapter’s focus on self-reliant, adaptable infantry units, the Households excel in urban combats and boarding actions. Though the Marines Adamant are uncompromising in their devotion to the Emperor, their disdainful and suspicious nature frequently makes for difficult relations with other Imperial organizations. It is notable that Households fighting alongside other Imperial forces will often refuse to share intelligence or co-ordinate their battle plans. However, their Code makes them utterly loyal to any oaths they or their forebears may have sworn, especially to those who have proved themselves time and again, such as the worlds of the Gharant system. ‘You think yourselves worthy of the seed of Manus? None of us are! But you shall have your chance. ’ – Brother Tonnrud, Flesh Wyrd. The Households’ Flesh Wyrds are responsible for recruiting and implantation, and often lead small squads to Halsstarrig to ‘recruit’ new initiates. Each Household has preferred clans and areas of the planet from which to recruit, but it is a source of some pride and amusement to ‘poach’ a promising recruit from the lands claimed by another Household. 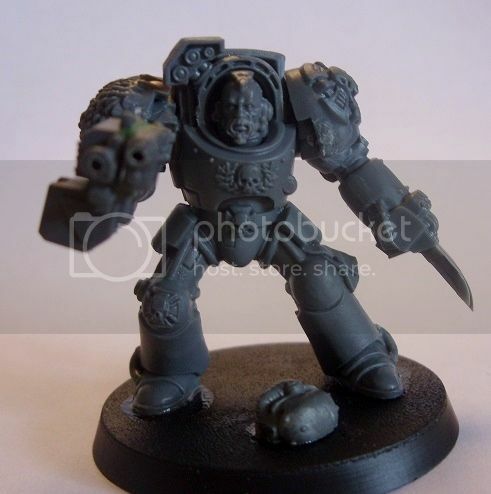 As successors of the Iron Hands, the Marines Adamant are blessed with gene-seed that is largely free of physical flaws, although in approximately one third of the Chapter’s brethren the Omophagea has become inactive. Detractors suggest that the Chapter’s instinctive mistrust of others is also plainly a result of their genetic legacy, a twisting of the Iron Hands hatred of the weaknesses of the flesh. 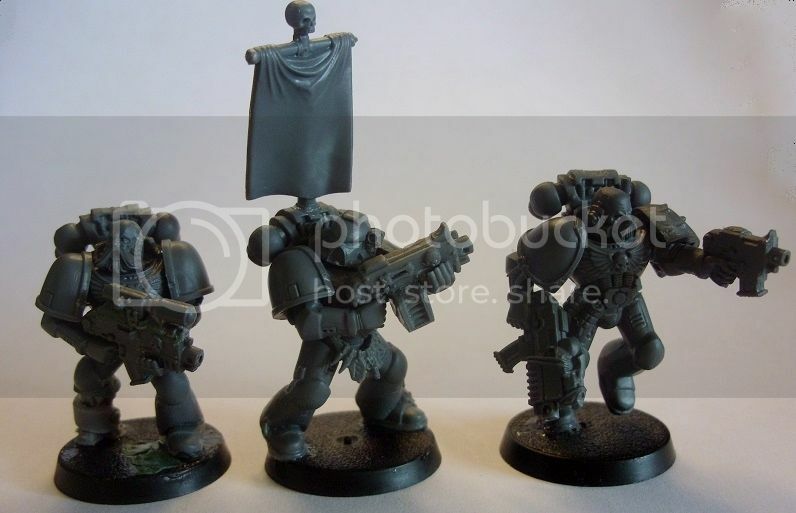 It is less clear if the Marines Adamant also share their forebears predilection for bionic modification, but they are certainly well supplied with them by means of their link with the Adeptus Mechanicus. ‘Emperor, gene-father! See the might of your sons!’ – Warleader Isorn Firewalker. The Households have no single war cry, as such are often selected depending on the current mission and personality of the commanding Warleader. However, these calls to battle do embrace common themes, including vows of loyalty to the Imperium or its worlds, as well as tirades against hated foes. Most notably, Imperial observers have heard challenging cries directed towards the Emperor and the Primarch Ferrus Manus, for them to see and remember the bravery, skill and determination of the warriors of the Marines Adamant. Edited by Lysimachus, 17 August 2017 - 02:35 PM. Edited by LySiMachus, 05 June 2015 - 07:19 PM. With that colour scheme people would always be asking you if you were playing a Deathwatch army. Went through the IA quickly and it looks good, nothing negative to comment about, apart from their very slight blandness (but that might just be me). I don't like the colour scheme though, far too dark. Thanks guys! 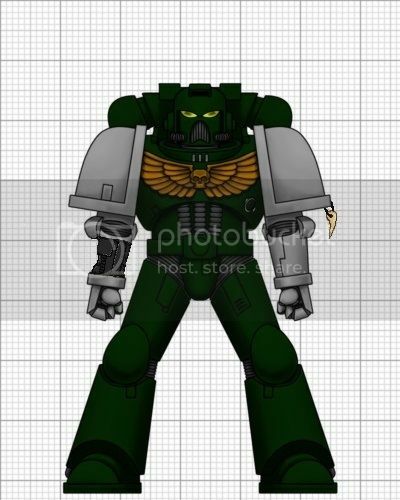 Lol, the pic does come out a bit dark, if you look at it from the right angle it's closer to what it's meant to be, basically DA Green with brighter egde highlights, shouldn't look like Deathwatch once it's painted. This is probably closer, maybe somewhere between the two? Edited by Strike Captain Lysimachus, 11 April 2013 - 09:38 PM. Did you edit the bionic and fetish in, or is that part of a new painter I haven't seen yet? As for colors, so long as you make it obviously green you shouldn't have to worry. Still deathwatch-y but still discernable. Ha, no unfortunately it's not the new painter, just me bodging it with Paint! I like'd better with one arm. But it's hard to tell without seeing an actual mini. I must say I really like outline you've got! Very simple but still distinct so as to not being bland. Very seemless blend of the Hands and Wolves without any obvious concerns. "The galaxy is a big place; you have room to work." IA: Imperial Viziers - A Chapter in Twain - new draft october 2013! Thanks Malthe, and yeah looking at it again I think you're right, one arm works better. Once again to Paint, think this time green is about right and one silver arm! Since that time mainly fought against encroaching Orks, sometimes defending, sometimes leading Imperial Crusades into Ork territories to destabilize growing power of Warbosses, also regularly sent forces east and south to support brother Marines against renegades of EoT/Maelstrom. Too be honest, the homeworld section is a bit ... well boring. To me it just reads as Space Wolves without the snow. I appreciate that is hard to create a unique culture when there's several million. I can't even think of any suggestions either. hmm. When larger campaigns mean that several Households fight together, can be led by a Warlord, elected from among Warleaders present. Certain amount of wrangling for power and the potential for personal glory it brings, candidate for position must be nominated and backed by at least two other Warleaders, (therefore must be at least 3 Households fighting together to appoint Warlord and max 3 candidates even if whole Chapter fights together). Voting to start, but if no democratic decision reached candidates fight in imitation of Halsstarrig custom. Generally to first blood, but on rare occasion, when two candidates so opposed that service to the other is an impossible request, to the death. Understandably, appointment of Warlord very rare thing, and may only lead as long as specific campaign lasts. I quite like this. Could lead to some interesting stories/events. Thanks Ferrus, I think the last one is actually more or less how I pictured it in my head! Interesting point, I guess it's the age old issue of never really conquering the Orks, they always come back however hard you beat them down! Would certainly fit with the IH forebear/geneseed personality, I'll see if I can bring it in when I write it up in full. The Homeworld is more than a bit Fenris-y, but I'm more aiming for celtic than scandinavian; misty, bleak cold rather than full on snowy, ice cold. Kinda like how they described Albion in the Warhammer Fantasy campaign a few years back? Probably is a little boring in itself, but I want the focus on the clans, not the planet. Thanks, I really wanted to emphasize the Clans/Households animosity and suspicion even within the Chapter, but if they were completely autonomous there would be no opportunity for any interaction/rivalry. The chance to be Warlord would give the Warleaders something to strive for, to gain glory and power, but not something that would affect the fractured nature of the Chapter (at least, not more than temporarily). Quick update done, fleshed out most of the sections, C+C very welcome! 4) Even looks a little bit like the IH 'Hand' badge! Edit: 5) Should be relatively easy to paint! Edited by Strike Captain Lysimachus, 31 May 2013 - 06:17 AM. Firstly, I like the idea of a celtic themed force (I wanted to do something similar in the future, but using either space wolf or fist geneseed). At first I was wary of the fact that you were using Manus' genes, simply because it doesn't get used often due to the chapter's particular quirk. Yet I think it works out fairly nicely, although I am not seeing a whole lot of Ferrus in these guys, more a combination of Dorn and Russ, but that could just be me. I like the idea of recruitment being a "taken by the mists" affair, I also like how the "Wyrds" are their own branch of the chapter more or less. There is a great deal to like and only small snippets that make me raise a partial eyebrow. Yet, when I read this, I can't shake that I am reading about Space Wolf / Executioner style folk, but then again I think that's kind of unavoidable given your theme. What truly sets them apart from other Chapter's like them? I know its hard to come up with a truly unique idea for a Chapter, but you have such good depth with the origins, the planet, the allies, the whole thing is solidly based, but something is missing and I can't quite lay my finger on it. The colour scheme is another thing, I personally don't think green when I imagine these guys. I get gray, maybe steel or iron colourations. A pale grey like their arm plate, maybe if you inverted it and made the arm the green part and come up with some sort of theme for that being the case. You could also make their left arm colour signify their household, to differentiate in that regard. Just a thought. I like the chapter badge, it makes sense and I think you're justification validates it. I guess my only qualms are minor on the whole, I think it needs to speak more like a true scion of Manus though, something is missing. I mean look at all the IH Successors to date and it really paints a vivid picture as to what being a scion of Manus truly entails. The lack of that self-loathing and near paranoia about weakness is something I can't quite come to terms with. I appreciate that you tried to take it into a new angle with them being superstitious, but that to me is more a product of their homeworld and upbringing than it is a product of their geneseed or their primarch. 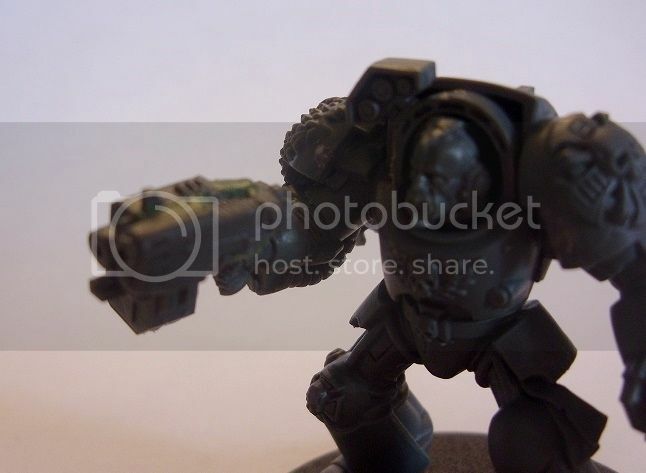 My Iron Hand Clan Company-- [topic='275162']IA: Clan Bracchus[/topic]   <---- FINISHED! What truly sets them apart from other Chapter's like them? I know its hard to come up with a truly unique idea for a Chapter, but you have such good depth with the origins, the planet, the allies, the whole thing is solidly based, but something is missing and I can't quite lay my finger on it. I think you’re right that I need to bring out the ideas I had for their personality a bit more. More on this in a second. I have to say I’m fairly happy with the green, and the arm is supposed to be a steel/silver. 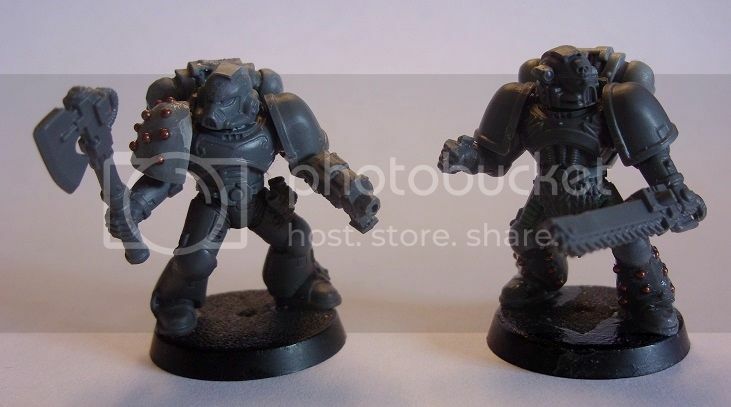 I really want to distinguish them from Space Wolves/Executioners (like you said) so I need something that is clearly different from grey/steel, hence the dark green. I’ve just got the first squads built though, so I’ve got to try a test mini anyway. I’ll definitely bear this in mind. I think it needs to speak more like a true scion of Manus though, something is missing. I mean look at all the IH Successors to date and it really paints a vivid picture as to what being a scion of Manus truly entails. The lack of that self-loathing and near paranoia about weakness is something I can't quite come to terms with. I appreciate that you tried to take it into a new angle with them being superstitious, but that to me is more a product of their homeworld and upbringing than it is a product of their geneseed or their primarch. I’m not honestly sure about this. Question: How many IH Successors have GW fleshed out in any detail? I know the SoM have been given a lot of fluff recently, but are there any others? As to the self loathing and paranoia, I’ve really tried to include this in the idea of their not really trusting anyone, not even their brothers within the Chapter. It’s a twisting of their personality based on the character of the home world, suspicious and cold. Maybe it needs to be focused on more, I’ll try to explain it better in the Beliefs section. You’re completely right about the superstitious nature, it’s not intended to be from Manus, and rather it’s an idea to bring in the home world character again and also separate the MA from the IH and the AdMech itself. Thanks again for commenting, it’s good to hear the thoughts of the IH Fraters! What truly sets them apart from other Chapter's like them? My pleasure my friend, would love your feed back on my own article if you can find the time! Its in my sig. As for their personality, I am definitely getting the old celtic aspect with things like the hearthguard and the like, but yeah they don't stand on their own two feet at the present. Great potential, just need to be pushed over the top. I can see that stepping towards a different colour might help differentiate the chapter from the norm, but why dark green? You don't think you'll get a lot of "neat dark angels successor" comments? I mean if you like it go for it, I'm sure it'll look solid regardless. Just giving their nature and their chapter icon a stone grey would be what I would go for. 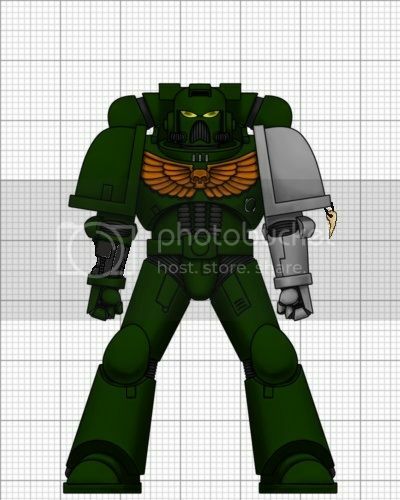 Something darker than anything the Space Wolves or Executioners would have with the dark green as a secondary colour. Perhaps an arm and shoulder insets? Eh, just do what you're going to do and ignore my rambling, haha! I want to see some pics when your test mini is up! I’m not honestly sure about this. Question: How many IH Successors have GW fleshed out in any detail? I know the SoM have been given a lot of fluff recently, but are there any others? As to the self loathing and paranoia, I’ve really tried to include this in the idea of their not really trusting anyone, not even their brothers within the Chapter. It’s a twisting of their personality based on the character of the home world, suspicious and cold. Maybe it needs to be focused on more, I’ll try to explain it better in the Beliefs section.You’re completely right about the superstitious nature, it’s not intended to be from Manus, and rather it’s an idea to bring in the home world character again and also separate the MA from the IH and the AdMech itself. "Fleshed out in detail" and Iron Hands in general is not an easy marriage of terms. I mean GW has barely given the Iron Hands the time of day, most of the information we have is from ancient articles or the latest book. I would even argue the Sons of Medusa have more information "written in canon" than their parent chapter does! Maybe I'm just being over dramatic. That being said, the "Machine like advance" and penchant for Bionics is a theme that runs through what lore we have for all of Manus' children, no matter their armor colour. It could even be argued that this genetic disposition to the hatred of the flesh is the true defining factor of what makes the Iron Hands and their successors unique in a galaxy of vampire catholics, werewolf vikings, and the like. The real appeal of the Iron Hands is their personality and the fact that they are cyborgs! It is also noted (somewhere) that the sole reason the high lords don't use IH gene seed for more successors is due to their disposition towards the habits of their parent chapter.. hence why it is believed to be a defect in the gene-seed. There is a clear reason why the UM's and ImpFists have wayyy more successors than the Iron hands do. I think that is what is throwing me off, the fact that they are Iron Hand successors but lack any of the defining features of the Iron Hands or there canon successors. It feels like you are just wanting them to have Manus' genes for the sake of having his genes and therefore not being just another "UM successor" or whatever. Not trying to ruffle any feathers mind you, but as of this moment it feels like making a blood angel successor who happen to lack the red thirst and black rage, wouldn't really work would it? My pleasure! Again, not trying to come down hard on you. More just trying to get those creative juices flowing! Keep it up. Edited by Ravenfeld, 03 June 2013 - 02:36 PM. I've had a quick read through, looks pretty good. I'll try to read it properly (as I think others have said, it's quite long! ) and post some decent feedback. I can see that stepping towards a different colour might help differentiate the chapter from the norm, but why dark green? You don't think you'll get a lot of "neat dark angels successor" comments? Lol, have you painted a DIY army before? I've done a blue one that people assumed were Ultras, a grey one that they thought were Wolves, even a purple Chaos one that got called Emperor's Children. It's par for the course! That said, I'm hoping that the silver arm, black badges, bionics and icons/fetishes will help to distinguish them from the DA. On a following note, I've finished building two squads of GH counts-as, and got a Tac TDA squad on the way from ebay (under £21!!!) to build some WG squad leaders. Once they're built I'll take some pics and get them sprayed up ready for painting. So that would be at most just the two then? Honestly, with such a small 'control group' to measure against, I think it's very hard to make any definitive statement about how every Chapter will be. Also, consider the vast differences between Chapters of the Ultras gene line, it's not like my guys are going that far away from what makes the IH what they are. Finally, remember that the MA are 4th Founding, which gives approx. 7/8 thousand years for them to be more and more influenced by their home world. All that being said, I get what you're saying. Edited the Beliefs section in particular to try and show the progression from IH to MA a bit better. Think that makes any more sense? Again, not trying to come down hard on you. More just trying to get those creative juices flowing! Keep it up. No worries at all, I'm happy to listen to anything anyone has to offer. I don't always promise to agree, but I'll always listen. Two squads of GH counts-as? GH? For what it's worth, green looks good. And I'd honestly be disappointed if a Chapter of that name didn't have some green in there. EDIT: Grey Hunters. Got it. Edited by Cormac Airt, 05 June 2013 - 10:35 PM. No I agree with the green being present, that's why I suggested the inversion of his current motif! But frankly the current scheme is starting to grow on me, especially when you consider that the painter doesn't have all the charms, talismans, and other details included to add some more character. Thanks for comments guys! Yup, GH from C:SW as it's the only dex that allows for squads with TDA leaders. + close up of kitbashed combi, was quite proud of how it came out! I think the rules state that you vow for the Codex being used. So you'd be vowing for the Space Wolves. I actually think you can vow to the forum you want, but you have to use the point costs and units from a specific codex. So while you are using the SW Dex, you can vow with the Liber because, well your chapter is a Liber chapter. Just make sure all the point costs are from your selected Codex. Ah, ok. I thought Successors of DA/BA/SW(if they existed!) vows counted towards the forum of their parent Legion and Codex? And then Ultras/Index Astartes/Liber Astartes vows all have to come from Codex: Space Marines? I think. Come to think of it, maybe I could vow for C:SM? Not sure what squad could have 2 plasmas, Sternguard? I guess the TDA could be a character, Captain probably? Edited by Strike Captain Lysimachus, 10 June 2013 - 04:32 PM. If you were going with C:SM it would be Sternguard yeah, and the TDA would have to be a captain yeah. Edited by Ravenfeld, 10 June 2013 - 05:11 PM. Nice scheme. My only suggestion would be to make the shoulder inserts black or dark-green (like the armour), otherwise the arms are a little too stark. The chapter badge and background are nice too.